I have been working on mobile projects for a yr now and worst part of the whole process is that you are never given all the devices to test it properly. 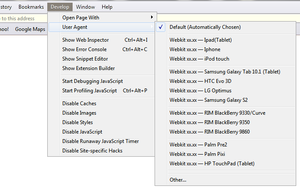 If your webkit mobile site is device specific only way left will be to use user agents. There are thousands of mobiles and which useragents to use and which not to use is confusing so here goes my list of useragents which i feel should be enough for now. As todays most mobile sites will be webkit compatable so my best bet is that you will be using safari for tetsing. All you need to do is copy the file below to the given folder and restart safari. Preferences >> Advanced >> Show developer menu on menu bar.